He hit all the right notes, but wouldn’t it have been wonderful if he could have used the past tense to describe the crisis of inequality? 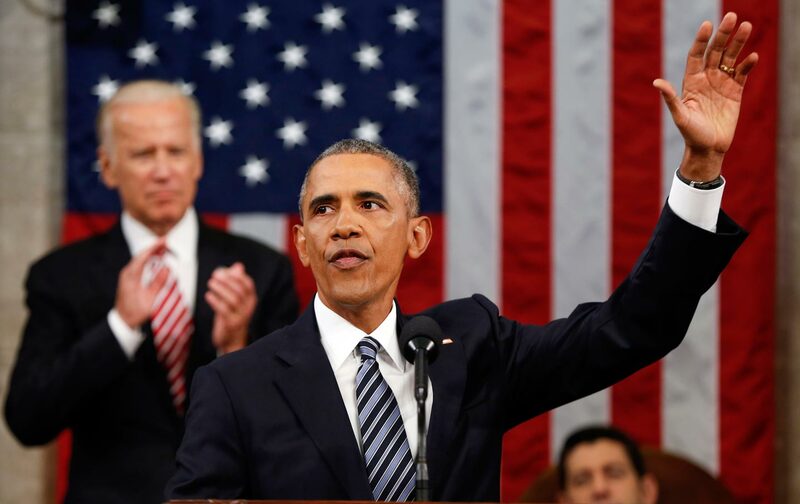 Seven years ago, incoming President Barack Obama gave a series of soaring orations—his electoral victory speech in Chicago, his inauguration speech in front of one of the largest crowds ever assembled in the United States, and his first State of the Union address, shortly afterward. All promised new beginnings and a better, fairer deal for ordinary Americans buffeted by vastly disruptive economic and political forces. All offered up a somewhat amorphous sense of hope as a salve for a damaged country and an anxious people. This week, as he began the final year of his presidency, Obama delivered a similarly grandiose, hope-filled State of the Union speech. He was, he announced, talking not just about the coming year but about the coming decades. Obama hit all the right rhetorical notes. In his opening remarks, he talked about the need for criminal-justice reform; about the dangers of a widening income gap; about the need to eliminate pay disparities between men and women; about the imperative of immigration reform and expanded healthcare access. Yet, the fact that Obama felt compelled to spend the first half of his last State of the Union address talking about economic reforms that still need to be enacted, and the second half trying to stem the tide of a rising, snarling nativism, speaks volumes about the ambiguity of his presidential legacy. Obama was elected in the wake of a catastrophic housing market and broader financial collapse. He spoke of big and bold reforms, and voters presented him with a once-in-a-generation opportunity to enact systemic change. He could, and should, have broken up the big banks. At a time when there was double-digit unemployment, he could, and should, have used his podium to push a Democrat-controlled Congress to enact public-works programs on a scale far larger than that envisioned by the American Recovery and Reinvestment Act. He could, and should, have used the moment for healthcare reform to argue the case for a single-payer system. He could, and should, have used federal dollars to massively expand the country’s affordable-housing and public-housing infrastructure. Above all, in an era of catastrophic inequality—of wealth, of income, of access to property, and, by extension, of effective recourse to the political process—he could, and should, have shaped a national discourse around the urgency for large-scale progressive tax reform, for trade-union rights, for a genuine living wage, and for the expansive public-benefits infrastructure that residents of so many other first-world democracies take for granted. Instead, Obama allowed the more radical impulses of his 2008 candidacy and the grassroots energy that underpinned it to be derailed by an increasingly assertive, and politically ruthless, Republican Party. As a result, Obama has presided over an economic recovery that, while real, is nevertheless frustrating in its incompleteness. Yes, the economy as a whole has grown at a healthy rate over a number of years, and unemployment has halved from its post-2008 highs. On the headline data alone, the United States is doing stunningly well. But the new jobs that have been created pay far less, on average, than the old jobs that were lost—which goes a long way to explaining why real median income for American families has continued to decline during the Obama presidency. Moreover, millions of people who grew so discouraged about their work prospects that they stopped looking for employment have simply vanished from the labor force entirely. They aren’t considered to be unemployed, but nor do they have jobs. Almost all of the economic benefits of increased productivity are flowing up the income pyramid to the relative handful of Americans at the top of the economy, leading to a concentration of wealth unseen in the United States in nearly a hundred years and the emergence of oligarchical power structures that more resemble countries like Russia and Mexico than, say, Canada or France or Germany. As for raising the minimum wage, despite Obama having made this one of his signature issues, at a federal level it remains at an abysmally low $7.25, a rate that hasn’t changed since July of 2009. For the working poor, the bottom 20 percent of the population, each year that the recovery endures has meant not more security but, paradoxically, more of a decline in real income. Which leads us to the second part of Obama’s speech—the need to confront the politics of division, of hate, and of scapegoating that is the flavor of the moment in the GOP primaries, and that is capturing the political imagination of large numbers who feel disempowered and economically vulnerable. That so many Americans are so insecure, despite the low unemployment and the generally good economic news, speaks volumes. When prosperity is broadly shared and institutions of authority are seen to work on behalf of ordinary people, extremism doesn’t take root. When, by contrast, inequality flourishes and powerful institutions are seen as working against the interests of regular Joes, then scapegoating and demagoguery take root. Obama has long been silver-tongued. He is, without doubt, one of American history’s great orators. The ongoing frustration of his presidency has been that, too often, the progressive rhetoric has soared over a political landscape scarred by trench warfare and an economy that continues not to deliver basic security to tens of millions of men, women, and children. Obama made similar statements eight years ago, on the campaign trail, and seven years ago when he was a newly elected president. He spoke eloquently about inequality during the 2012 campaign, and has done so episodically at various moments since then too. Wouldn’t it have been wonderful if, in his last State of the Union address, he could have used the past tense to describe the crisis of inequality, and, instead of pointing to a raft of economic reforms that still need to be enacted in the coming years, given a nod to a comprehensive social equity agenda that he had managed to push through Congress during the two terms of his presidency?